I’m not big on most annuals, especially bright, garish bedding plants, so I never tried growing snapdragons (Antirrhinum cv.) before. Actually, it might be a tender perennial, but I’d need to check up on that. In either case, it’s functionally an annual here. 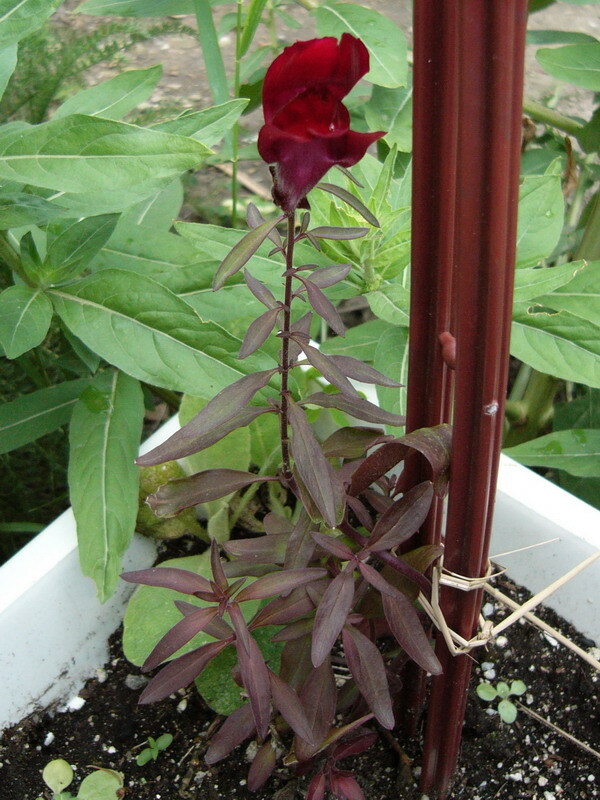 However, earlier this year when I was doing a seed order, there was a snapdragon called ‘Black Prince’ with dark red flowers and very dark foliage, so I thought what the heck. I didn’t get good germination with the first sowing and there’s only one plant survived from it. I had better luck with a second sowing, but the plant from the first batch flowered several days ago. It’s not dark enough to warrant going on the Black Flowers page, and it never had any pretensions of being a black flower, but it’s still beautiful. Despite also being rather tiny, it still needed to be staked up because of the f**king winds we’ve had this year…and the past four years, it seems. This one, and eventually the ones from the second sowing, is in a planter box. I usually grow heliotropes in there, but never got around to getting any this year. Some nicotiana ‘Chocolate Smoke’ is popping up in the planter, though, so it will be interesting to see what sort of combination they make. I have a feeling the nicotiana will probably swamp the snapdragons, though. However, I did update the Black Flowers page with my new pansy, ‘Black King’. I got the seeds from the same source, and oddly enough, it flowered at around the same time as the snapdragon. I sowed them at the same time, but I guess pansies just take longer to get to that point, despite usually being spring flowers. Well, this summer solstice I spent four and a half hours in the garden and it was wonderful. I took care of several of the little tasks that keep getting put off, plus a couple major ones. One of those major tasks was filling and stocking the new large tub pond. We actually had a bit of rain last night; wish it were more, but beggars can’t be choosers. But it was enough to fill a couple of the rainbarrels, so I had enough water to start filling the pond. This in turn meant I could take the plants out of the smaller tub ponds and containers scattered about the place and rehome them. …I seriously never realised how many water plants I have. I must be crazy. I got a lovely surprise from one of the tubs, however. Well, actually, it was rather an ugly surprise, but it was nice. This tub had only a miniature water lily (Nymphaea cv.) in it, plus a bit of bladderwort (Utricularia gibba) to control the mosquitoes. It’s only about fourteen inches deep. When I raked my fingers through the muck that had accumulated at the bottom, I got the shock of the day to find a dragonfly larva. I went and got a sieve and ended up finding five larvae (plus one dead). I have no idea what the critters were feeding on – dragonfly larvae are carnivorous and prey on other aquatic insects, crustaceans, tadpoles, and even small fish. Anyway, I rehoused them in the big tub, and when the water in the smaller tubs settles, I’ll add it as well – it will contain all the pelagic fauna that makes a balanced pond ecosystem and helps control algae, the pondkeeper’s nightmare. When most of the water is out, I’ll have a hunt for more benthic fauna. I also found NO mosquito larvae. People look skeptical when I tell them that since starting to keep these pond tubs, I actually get bitten by mosquitoes less. The fact is that yes, standing water attracts mosquitoes, but it also attracts dragonflies, especially with vegetation around. A dragonfly can eat over fifty mosquitoes in a day, plus other meals, and dragonflies have an estimated 95% success rate at hunting. This makes them one of the best predators in the world. And happily, at least one dragonfly has claimed my garden as its territory. I think I’ll get a board or something and balance it on one corner of the big tub (it’s rectangular) and put a few of the carnivorous plants on it. It would help complete the look, as many carnivorous plants are bog species. So you could say I spent a summer day splashing about in water. How nice. Today I finally installed the guide wires (not guywires) to train the grapevine (Vitis ‘Bluebell’). I’m not sure why the cultivar is called ‘Bluebell’; all the pictures I’ve seen of the fruit show grapes that are almost black. Anyway, I should have done this weeks, even months ago…in fact, arguably since last year. Anyway, it’s done now and I can start training it at last. I say at last because it got held back a year by the local chapter of the minions of hell, a.k.a. the rabbits, who came the first winter it was planted and chewed it down to a stump. So last year it had to start over. Otherwise I could have been looking forward to a bunch of grapes this year. I’ve never trained a grapevine before and there are many methods to choose from, but I’ve settled on double leaders on a 6-arm Kniffen system. That is, two main stems, with each stem being allowed to produce 3 side branches. All of the branches on a given stem will grow in the same direction, and in the opposite direction to the other stem. I think it’s ambitious for a newbie, but grape plants are vigorous growers and therefore forgiving of pruning mistakes. ‘Bluebell’ is apparently a self-pollinating cultivar, but even self-pollinators set fruit better with another pollinator nearby. I have two other grape plants that I haven’t quite decided what to do with yet. One is a wild grape that keeps showing up in a friend’s garden; he gave it to me last year, but I haven’t gotten around to trying to figure out the species yet. The other is also a wild grape, a native species called the summer grape (Vitis aestivalis) that is supposed to be quite tolerant of hot, dry, sunny areas. I’ve been looking for one for ages and this year I lucked out. The original intent was to put it up against a very hot, sunny brick wall, but now I’m not so sure. I might grow them in containers and train one of them into a standard, like the old Victorian gardeners liked to do. The other blue concern today is the jay. Or rather the family of blue jays (Cyanocitta cristata) that’s taken up residence in the area. This is a first; normally I don’t see bluejays in the yard before September, when they make their way south. They’ve certainly never settled here for the season in all the time I’ve lived here. Normally I would be happy with this situation. Blue jays are a native species, and another species of bird in the area is a sign of increased biodiversity, which is good. But although I love birds in general, I don’t like blue jays. They’re loud but don’t sing (at least, they seldom sing nicely), and they’re greedy and aggressive, and often chase away the other birds…such as the ones that do sing nicely. I know I haven’t been hearing the chickadees as much in the past few weeks. Just today, in fact, I saw a jay chasing the local cardinal (Cardinalis cardinalis), who is an old friend. Not impressed. Just updated the Black Flowers page to include the beautiful Iris chrysographes; I bought the plant last year and the blooms first opened today. I also added a picture to the Rose page; all the roses are blooming at once (for the second time ever) and I actually got a picture of it this time. Speaking of roses, I got another one a week ago, a beautiful purple miniature called ‘Diamond Eyes’. No picture yet though. I splurged last Saturday and bought a pond tub – a purpose-made one, as opposed to an ordinary tub or undrained large container. It got delivered on Tuesday. I’ll admit it was a bit of an impulse buy, but I don’t regret it at all. It’s 51 x 31 x 18 inches, which is deeper than many prefabricated ponds available, and that’s always been one of the main things holding me back from getting one: most of them just aren’t very deep. In fact, I would have liked it to be even deeper, say 6 inches or more. Good thing I was revamping the container garden anyway, because that’s the only spot left with enough space to hold the pond where it would get enough sun. I’m not burying it, for a few reasons. First, my soil is just too. damn. hard. and. too. damn. stony. to excavate something that size and then deal with the spoil. Second, the entire property is on a slope, so I’d have to get fancy with the levelling (this is actually a minor consideration). Third, although I would love to have an in-ground pond that might even possibly attract a frog or toad or two (I love amphibians, and not just for their wildlife value; I really think they’re ridiculously cute and yes I know I’m weird), the local raccoons would make an absolute wreck of it and everything in it. So I piled up some stone (and I have a lot of stones in my soil), levelled it off, and sat the pond on top of it. The elevation, plus the height of the tub itself, should make things harder for the nasty little bastards to mess things up. While they could easily jump up, even raccoons would have a hard time balancing on the lip of the tub while digging around inside it, without falling in (which they might decide to do anyway…). As long as I don’t put anything around it, they won’t having anything to sit up on. Also, having it a few inches off the ground should make it a little easier on the old back. Not getting any younger here. In winter I can drain it and turn it upside down. It will be interesting to see if water evaporates slower or faster from one large container than a bunch of smaller ones. It would be nice to run a little fountain in it, but it’s too far from a power outlet. It does, however, mean I need to rethink my original idea for what to do with the container garden. And now we need some rain. Last good rain we had was over two weeks ago, and the rain barrels are nearly empty. And therefore, so is the pond. Why does it feel as if I have so much to do this spring? I didn’t buy and start that many plants, did I? …oh wait, I did. Right. I think I’m about two-thirds done with the planting out and potting up. Space is tight this spring. Really tight. I’m revamping part of the container garden, so things have to be done in stages…when actually everything needs to be done yesterday. After my whole life gardening, it’s still a surprise when suddenly everything seems to grow overnight. Soon I’ll need to cage around the strawberry patch to keep the rabbits and squirrels (hate them all) and birds (like them a lot, but I’d still rather eat the strawberries myself) out. I also had dreams of planting all the brassicas in one spot and fleecing the whole thing over to keep out the accursed demonspawn cabbage white (Pieris rapae) butterflies, but it doesn’t look as if that’s going to happen. We’ve had a nice, wet spring, and I mean it when I say I’m glad of it. But, and I should have seen this coming, it already means that the roses are starting to show black spot. Not only that, but the rose sawflies (Arge sp.) are out in force. I swear, they get worse every year. And to top things off, I just got a mandevilla (Mandevilla cv.) dumped on me. It’s actually a rather nice one, but I wish my bloody relatives wouldn’t assume that just because I’m a mad, obsessed gardener, I’m happy to have any old rubbish in my garden. I wish this whole post didn’t look so negative, because it’s actually been a really great spring in the garden. It just feels that it’s been too busy to enjoy it.